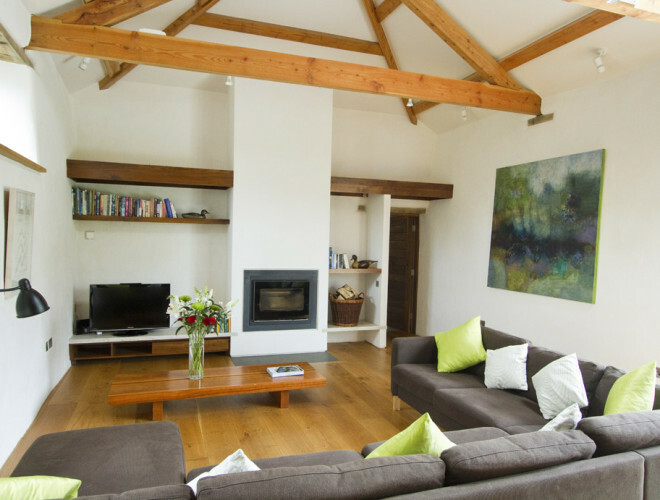 If you are looking for larger-sized holiday cottage on the Helford with a wow-factor, in an unspoilt location near the coast, and with plenty to do on the doorstep, then Avallen Barn is for you. This is a very special barn in a very special place, with its own large garden opening out to an orchard and wildflower meadows, and a footpath leading in one direction to Helford village, and in the other… to Frenchman’s Creek! Avallen is the largest of a small group of adjoining barns at Kestle Barton, an ancient Cornish farmstead situated above the spectacular Helford River. All of the buildings have been lovingly restored or imaginatively converted to the highest sustainability standards — one is a small, high-quality art gallery. As soon as you arrive, two things will strike you about Avallen Barn. The first is the extraordinary amount of care that has been taken in the conservation. All of the original doors and windows have been cleverly incorporated into the new layout and all of the old hand-cut roofing tiles have been re-used and beautifully re-laid. Secondly, whilst Avallen is historic, it is also stunningly modern, with glass and steel architectural features and abundant technology to cook and entertain with. That ancient and modern can live together so happily is testament to the vision and commitment of the owner, and the skill of the award-winning conservation architect who created this holiday haven. The superb architectural quality or Kestle Barton has been acknowledged with several awards including the Conservation Category in the RIBA South West Town and Country Design Awards 2011, and the Green Apple Award 2011 for The Built Environment and Architectural Heritage. 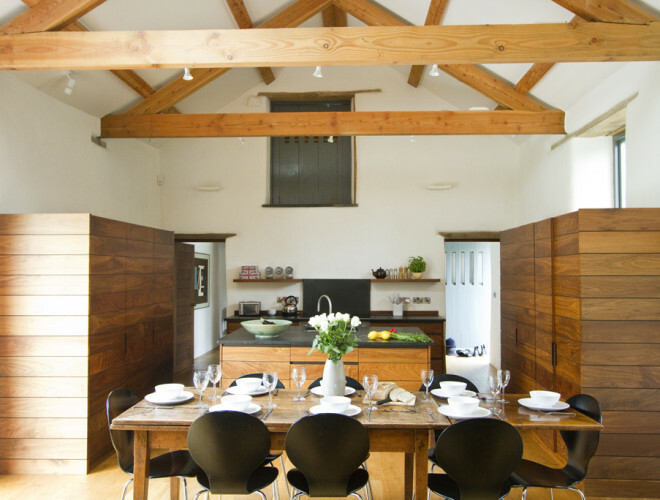 Passing through the original two-inch-thick barn door, and past the hallway with its contemporary staircase (and handy storage), you will step into the heart of Avallen — a very large open-plan living, dining and kitchen space, flooded with light and opening onto the large garden through French doors. Here, the enthusiastic cook can indulge culinary passion, taking advantage of the thoughtfully equipped kitchen with its array of appliances and utensils (most of which are cleverly hidden which gives the space a clean and uncluttered look), while beyond the welcoming pine dining table, those less-inclined to chop and simmer can wallow in yards of sofa, enjoying the wood-burner, indulging in the games console, or…. simply enjoying the solitude. 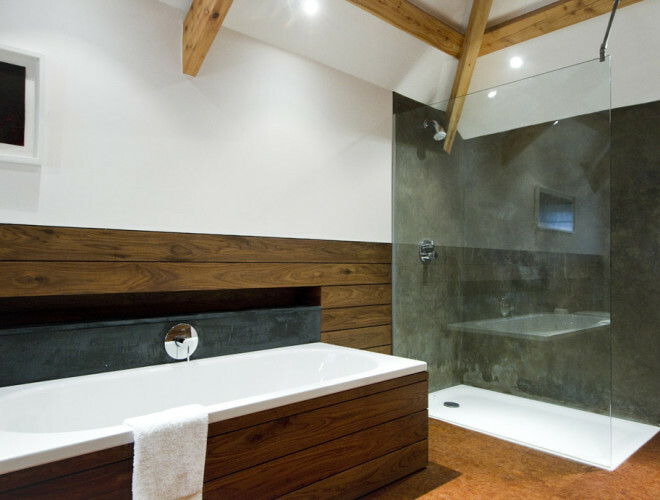 On the lime-rendered walls you will find striking contemporary paintings, and all fixtures and fittings are of the highest standard. Beyond the living area you will find bedroom one. This is the glamour bedroom, with sofa and writing desk, hotel-style zip-and-link super-king sized bed and its to-die-for en-suite bathroom — with walk-in shower and cavernous double-ended bath. You will find two more bedrooms on the ground floor — another double with delightful views into the secluded garden, again with luxurious zip-and-link beds, and a cosy twin room. Also on the ground floor is the light and bright family bathroom. On the first floor a hang-out space invites play and interaction, with sofas, a football table, books and games. Beyond that is bedroom two — more like a mini-apartment than a bedroom, this loft-style space comes with the same generous king-sized zip-and-link beds as found elsewhere, but also boasts its own wood-burner, juliette balcony, designer sofa and TV. 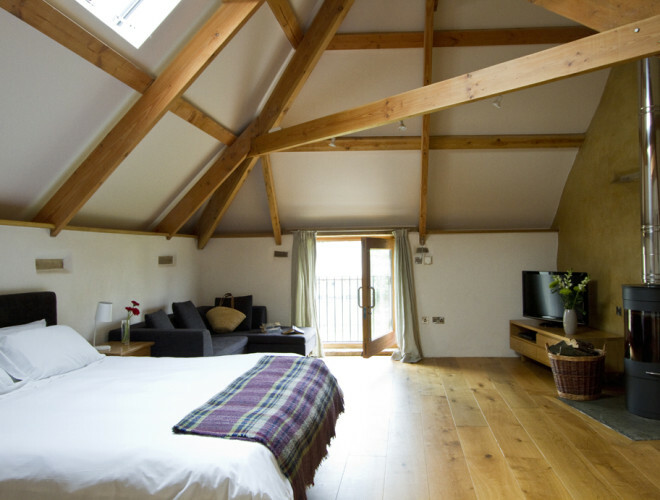 All rooms at Avallen have individually controlled underfloor heating, fueled by carbon-neutral wood-chips, grown in local woodlands. The setting of Kestle Barton is enchanting. 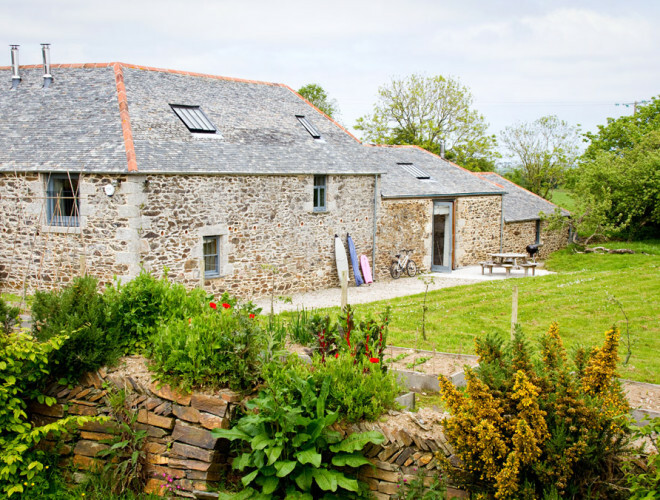 After passing through picturesque hamlets, and along typically winding and wooded Cornish lanes you will arrive at the farmstead. Turning in through the gate, you will pass the discreet art gallery (more about that later) and come to a halt in the old farm yard — there are spaces for four cars in front of your barn. Avallen forms one ‘wing’ of the rambling barns (there are two other smaller barn here that also have seasonal guests). You can access the large rear garden around the side of Avallen, or through the property. The garden itself is laid to lawn, and you will find chunky garden dining furniture and a barbecue for al-fresco cooking and dining. Beyond your private space is a small kitchen-garden managed by the adjoining art gallery, and beyond that (over a small stile) is the art gallery’s own garden which is both beautiful and imaginative, and often contains sculptures. You can also access the meadows and orchard from here, which you can roam freely (both are shared by other guest and gallery visitors). Well where to start? 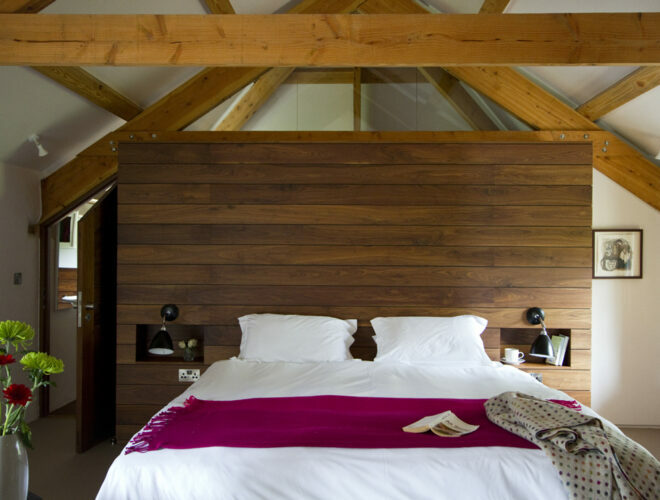 The award winning architecture, following conservation and sustainability principles, using natural materials and the eco-friendly heating system fuelled by locally-sourced woodchip. The captivating location… the art gallery… or the farm itself which continues its ancient role with beef cattle, orchards and a new walnut nuttery, but now managed in a benign, organic system to allows the rich and varied wildlife to thrive. The surrounding area is one of west Cornwall’s most tucked-away secrets. Sheltered and wooded with ancient pathways meandering down to secret creeks. The farmstead is situated equally between du Maurier’s Frenchman’s Creek and the tiny village of Helford with its unforgettably ancient pub. Superb sailing waters, wooded valleys and creeks, impossibly charming fishing villages, stunning National Trust cliff-tops, pristine beaches and sweeping heathland are all to be found within a fifteen minute drive.